Your iPhone is pretty amazing. You have access to libraries of information right at your fingertips. You can communicate with people anywhere on the planet. This is especially useful when you're a student. It's an incredible thought when you realize this wasn't possible just 10 years ago. But all of this requires power and the more you utilize your iPhone, the more power is drained from your battery. That's why we've gathered some tips to prolong your battery life while on your school trip. 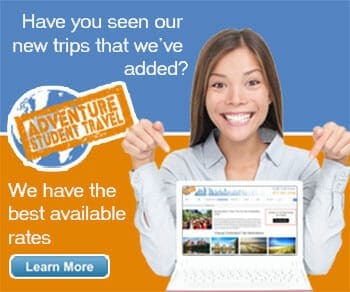 Share them with everyone in your student travel group. Use airplane mode. Airplane mode turns off anything that communicates on your phone: WiFi, Bluetooth, cell service, etc. All of these things use battery power. If you don't need to communicate with anyone for a while, use airplane mode to extend your battery life. You can still use anything on your phone that doesn't need internet - downloaded music and books, games, camera, etc. Besides, it may not be a bad idea to disconnect from your phone so you fully enjoy your school trip. Turn off Bluetooth & WiFi. If you like the idea of airplane mode, but don't want to be totally disconnected, you can gain some of the benefit by turning off some of the functions manually. Bluetooth & WiFi use battery power by looking for networks and devices to connect with. If you don't plan to use apps that need a lot of data through WiFi, turn these off. You'll still be able to receive calls, text messages, etc. Beware of your signal strength. Student travel often means a charter bus to reach your destination. Driving often means that you might go through areas with little to no cell signal. There is a signal strength indicator in the top left of your iPhone screen. If you have little to no service, your phone will continue searching for better service and run your battery down faster than anything else. When this happens, the only fix is to relocate to an area with better service or switch your phone to airplane mode for a while. Revamp notification options. There are multiple ways every app can notify you of anything. If you turn on every option, your battery will suffer. Minimize the effect that notifications have on your battery by turning off vibration, choosing options that don't require your screen to light up, or turning them off altogether. Even if you only do this while you're on your school trip, you can benefit from a little more time on your phone. Keep your software updated. Many updates fix bugs that also drain your battery. If you keep your phone updated, it can enhance battery life. Close apps after using them. After you've used an app, shut it down. If you leave it open, it will continue to run in the background and drain your battery. Now, if you allow background app refresh and other similar things, shutting down an app may not make much difference. But if you're following all these recommendations, closing an app is one more way you can prolong your battery life. While traveling, you are never guaranteed a power source to charge your phone. But running out of battery life while away from home (especially during student travel) is definitely not a desirable option. If you're really nervous about saving your battery, look into getting an external battery pack. (Find out more about them on our "Media Gadgets for the Frequent Traveler / Part 1 of 3: Foundation Items" blog.) 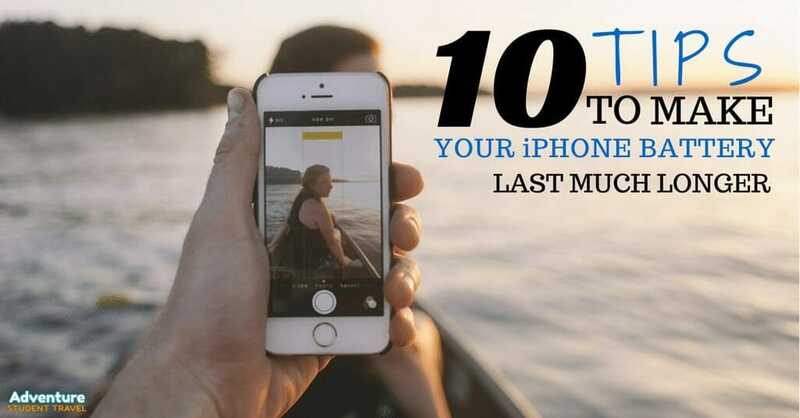 Use these tips to avoid the inopportune moment when your iPhone dies while trying to photograph part of your school trip.